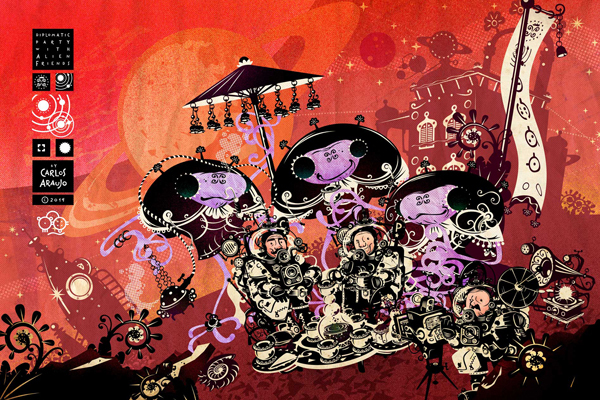 “Diplomats” or “Diplomatic Party With Alien Friends” is a “extended version” of the artwork by Brazilian illustrator Carlos Araujo previously seen in the pages of Göoo Magazine #15. Now you can see the rest of the tale of this first contact between wide-eyed earthling and bug-eyed alien… The very moment when both parties are getting ready for a photo shoot. This piece is available for purchase at Society6: Gallery quality Giclée print on natural white, matte, ultra smooth, 100% cotton rag, acid and lignin free archival paper using Epson K3 archival inks. Custom trimmed with 1″ border for framing. Grab yours now!